Begin by heating a pot with a little oil, add the shallots, garlic and thyme. Stir this gently for 1 to 2 minutes. Now add the white wine and bay leaf and bring to the boil. 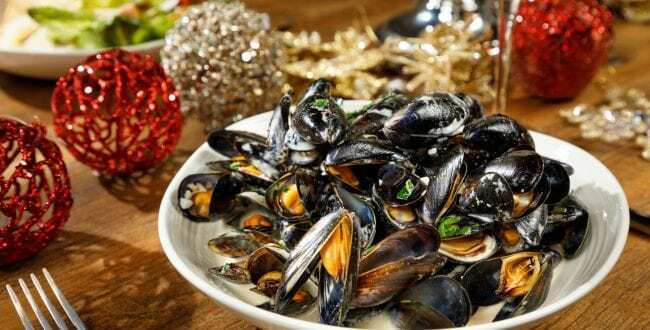 Place all the mussels in the sink under cold running water and give them a good wash around each other trying to remove any beards or gravel or sand that may have gathered on them. Place them in a strainer and strain well until all the water is gone. Add the mussels to the pot of boiling white wine and place a tight-fitting lid on. Steam for about 2 minutes before giving the mussels a really good stir and adding the cream, then return to the heat for another 2 minutes. By now all the mussels should have opened and are ready to serve. Just finish with a little freshly chopped flat leaf parsley and a squeeze of lemon.